When I first started sewing men's shirts, I made them out of vintage cotton/poly percale sheets I found at the thrift store. In retrospect, I should have listened to the many Pattern Review commenters on my early reviews who told me that I'd have a much easier time working with 100% cotton fabric. 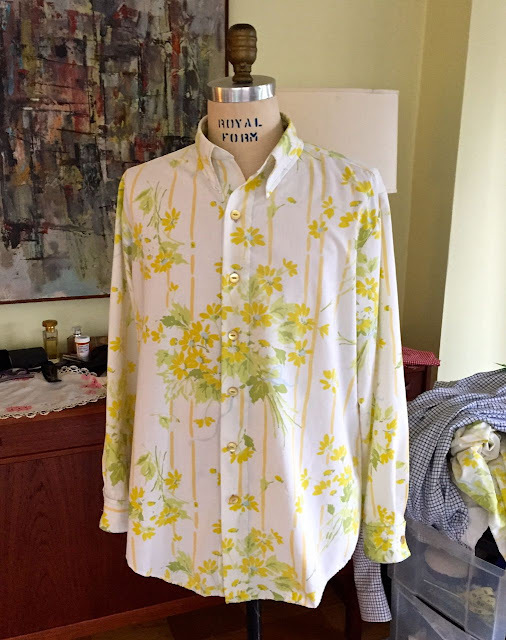 It wasn't until maybe my 5th or 6th shirt that I decided to spring for cotton fabric, which made shirtmaking a much more pleasant experience. It also resulted in shirts that I actually wanted to wear. Because no matter how playful those 1970's shirts looked, they felt clammy on the skin and smelled bad when I perspired. Here are a few of my early efforts (from summer of 2009). Maybe you slept on some of these prints in your youth. This weekend I had to make a shirt muslin for a male client who wears a size Large or thereabouts (16 1/2 - 17" neck). I headed to my vintage sheet stash for fabric. I found a 50/50 cotton/poly blend I'd bought recently at the Salvation Army (pictured at the top of this post). I like the print but, working on the muslin, I was reminded of some of the challenges of working with these sheets: they don't press sharply and tend to droop, plus they're tough to ease. But I do like the way my muslin turned out! I used Simplicity 8541 from 1988. The only change I made (unrelated to fitting) was to narrow the collar an inch or so. This shirt went together quickly. 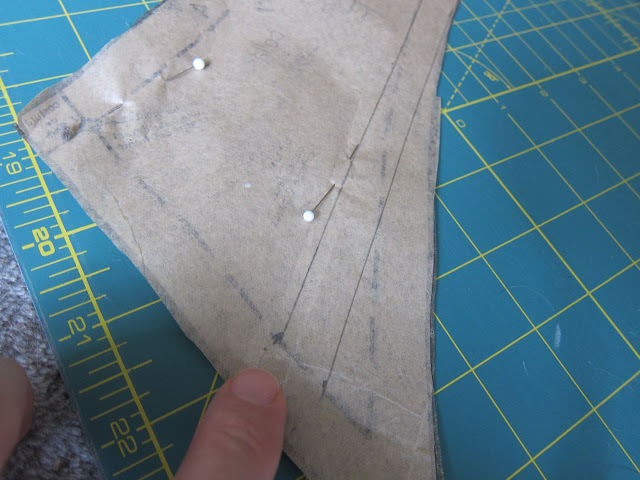 If you don't flat-fell your seams or bother with sleeve plackets (the pattern calls for just binding a "v" slit cut above the cuff, aka, a continuous lap placket), you save a lot of time. 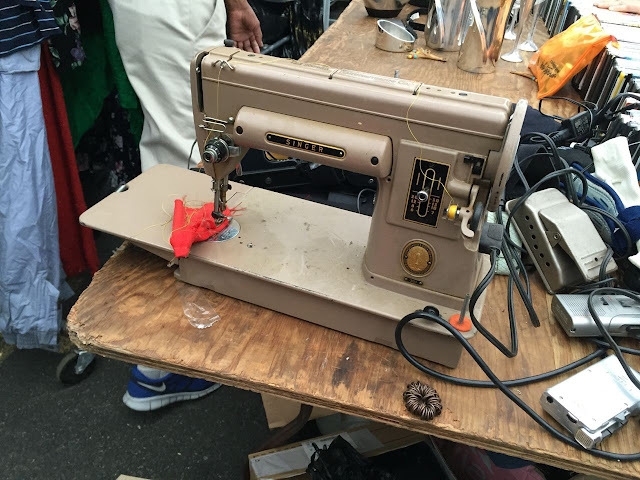 In other news, I passed on a vintage Singer 301 at the flea market yesterday. It had a few issues (no attachments, no case, no original foot, among other things) and I certainly didn't need it. It would have been fun to play with but not for $50. In closing, I think if were to advise a beginning sewer, I would no longer recommend sewing with cotton/poly sheets. If you can find a 100% cotton sheet, that's another story. Do you agree that it's better/easier for beginners to start with all cotton? 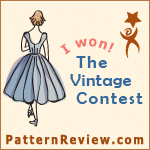 The patterns on those vintage sheets are bold and really stunning. The scale of these patterns works well for shirts; were I your client, I'd request to keep the muslin. Most of the shirts I make for Alex are basic white to wear to church, and because they're so small and hard to iron, I go with a cotton/poly batiste. It's lightweight, which is good for Georgia summers and doesn't crease as badly as 100% cotton. 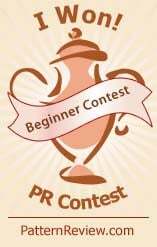 For beginners? No, not even a 100% cotton sheet for shirts. Sheets are treated with all sorts of chemicals to make that no-iron finish, and the finish wears unevenly on the fabric. Sheets are often hard to sew through as well because of the high thread count. Maybe as a muslin for a simpler garment like a skirt or for curtains, sure. I say no on the sheets too. Avoid quilting cotton, but otherwise even a cheap cotton for garments would be better way to learn how fabric behaves. I had to learn to avoid quilting cotton. 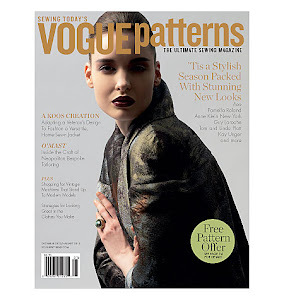 I love the prints and color combinations but they don't drape well and seem to stretch out of shape quickly. I have never used sheets as I remember how awful they were to sleep on in hot pre-air conditioned summers. Hot and clammy, at the same time. Icky. I love these theyre so much fun and well made. 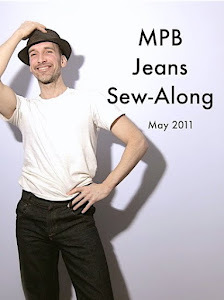 So cool you can recreate a bit of fashion history too. I owned sheet set no. two in the 70's. They lasted forever. Shirt number 2 must have been a popular sheet pattern. The full ensemble, quilted bedspread and all, were on my parent's bed about 1979 or perhaps the early 80s. 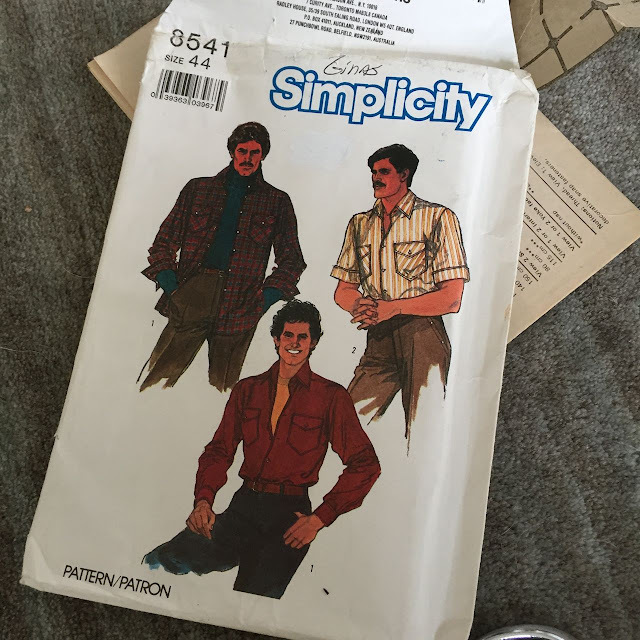 Ah, the men of Simplicity 8541! What is it about a mustache and/or a plunging neckline?? I owned sheets exactly like your second shirt but never again for poly-cotton! Love your latest...men do look good in florals and stripes! I love the blue shirt with the rose collar! Just be sure you use sheets in really nice condition. No fun to sew something only to have the fabric rip. Yes, it happened to me, not worth my time. 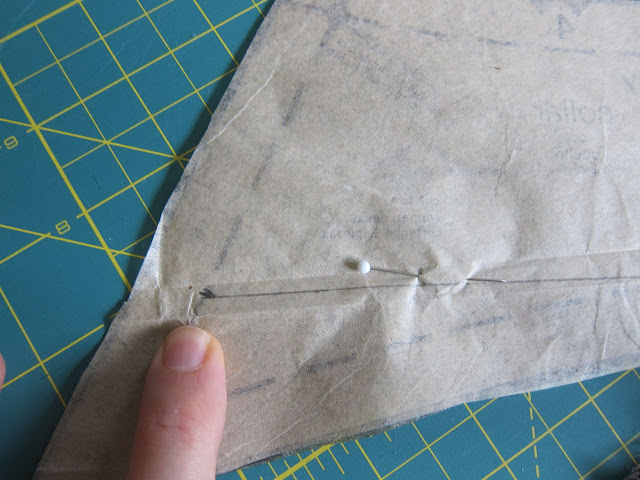 I would recommend that beginners start on sewing samples using cotton muslin. Cotton muslin is fairly cheap, keeps its shape pretty well, and easy to sew with. I wish I had started sewing on cheap, simple cotton fabric back when I was a beginning sewer instead on working directly on the self fabric. Haha. But yeah, you live and learn. Yes to the cotton as long as it's a firm cotton with a good hand and doesn't fray. Not all cottons are created equally and some can be a problem for beginning sewers. 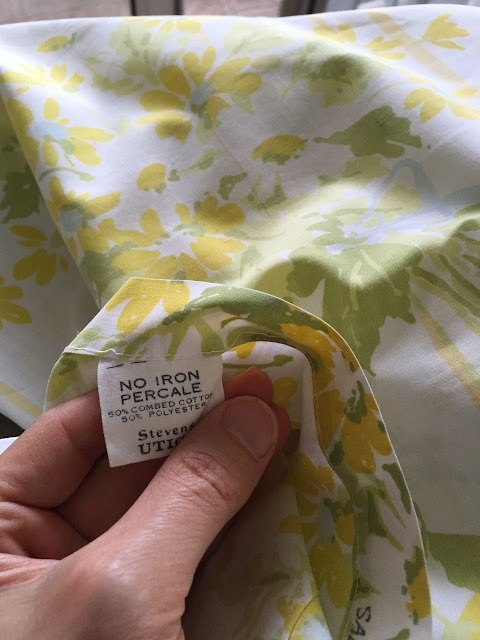 I love vintage poly cotton sheets, but use them for garment bags, shower curtains, summer duvet covers, that kind of stuff where I want a bit of light weight pretty and no ironing. I love your sheet shirts, especially the one with the rose on the collar. Please, please, please say more about how you finished the seems and the v slit plackets. I am making my first shirt using flat felled seams and a standard, complicated placket. It's good practice, but I would love to learn some less time consuming alternatives. And while I LOVE Liberty tana lawn for closes, I think yout bedsheets shirts are to die for. I've used sheets at times too and never had a problem. The patterns can be stunning. I have a beautiful floral I'll be making up soon. Please ignore the typos. I'm using my iPad and auto correct is just making things worse! What I find fascinating is that it's almost impossible to buy (new) printed sheets these days. I have been looking (and looking and looking) recently -you can get flannel sheets that are printed but mostly sheets come only in plain colours here. If you want a print (whether or not it's floral) you need to get a quilt/doona/duvet cover with matching pillowcases. Like you, I buy pure cotton vintage sheets from eBay and in the local flea/craft/'antique' market. There's nothing like those silky pure cotton or linen sheets. I've even found bridal sheet sets and sheets with beautiful borders and good Italian hand embroidery that look like they never made it onto a bed, being too 'good' to use. If I had a roller iron, I'd use them all the time. I never buy anything Fieldcrest as their poly/cotton pills badly, even when new. I completely understand! Being self taught no one told me about the right usage of fabric until I figured it out myself - I spent many a years sewing things out of bedclothes as I couldn't afford anything else! You bedsheet still works well for a muslin. Shirts should always be 100% cotton, or cotton/lyrca. There are poly fabrics that are used in golf shirts that are moisture wicking which means it will not feel like you are wearing a garbage bag in the summer. 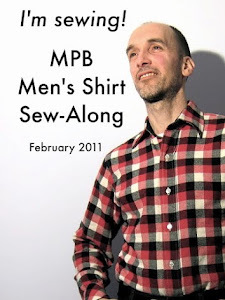 David Coffin, pointed out that you can only wear cotton/poly blend shirts on only the coolest days. 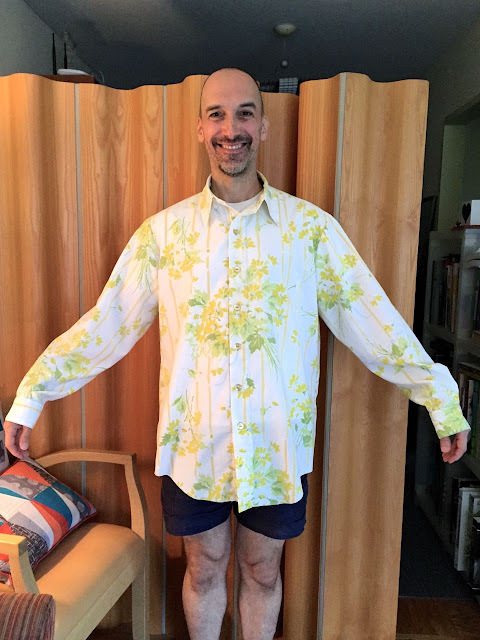 I learned my lesson wearing poly/cotton shirts in the summer and i got rid of them all. You liberty of london shirt is just beautiful. I buy 100% linen and cotton drape panels, tablecloths, and bed sheets at garage sales for pennies. The linen is usually made up in to wearable garments and the cotton as muslins. I feel like what I mostly see at garage sales is 100% cotton. I have never had to use a blend and can imagine the frustration of trying to get it to hold a press. IKEA has for a long time sold 100% linen curtain panels that are wide and long and I find them all the time at tag sales for cheap. They just don't make fabric like they used to and the 70s were the worst! They had just started using polyester in fabric for garments and it was either too much or too heavy. Even garments and garment fabric from that time were hard to sew and hard to wear. I know because I had to live through that horrible phase. Today isn't much better as most of our cotton fabric for garments is coming from china and have no finish what ever and is usually thin and flimsy. I use old sheets for muslins all the time, but never for garments. I have two questions for you Peter: 1. Why are you spending so much time completely finishing a muslin shirt? That's a lot of labor doing topstitching, buttons/holes, and finished hems, out of an inferior fabric, for a garment that is supposed to be a fit and discard item. 2. Where on a man's shirt are you having to ease any seams? I hope it's not the sleeve cap, 'cause a man's sleeve cap does not need any ease, and do not believe what any one tells you, no ease needed! 1. Just for the fun of it! 2. On this pattern, the back eases into the yoke a bit. I made a pair of jeans from a sheet I got from a thrift store (triple thickness). No idea if it is cotton, but it worked out well. Sheets are very useful for home dec projects. I've made valances, tier curtains, bedskirts, table covers, pillow covers and other items from sheets. Check out the clearance bins; there always various sheets available so it's quite possible to do a nicely coordinated room for relatively little money. Also home dec projects are more "forgiving" than garments so the drape and fit don't have to be as precise. Thats a great collection of sheet shirts. I have one I made out of a wild lime green large floral print. The shirt only gets worn occasionally and spends a lot of time in the closet. Haven't been able to get rid of it because I like looking at it every now and then. Even so its a poly cotton blend. I learned a lot making it. Its fun to wear and shock people with it. The poly/cotton blend isn't the most comfortable fabric and is better for cold days. So for practicing and muslins I say go for the sheets. For practical wear probably not the best choice. 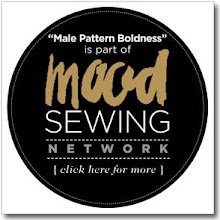 All in all who wants to sew with fabric that doesn't inspire you to make something. I don't want to knit with yarn that doesn't inspire me. Sheets are inexpensive and come in rad patterns so I say practice on the sheets and then move on to a more suitable fabric for your project. I'd say not a too light cotton, though. 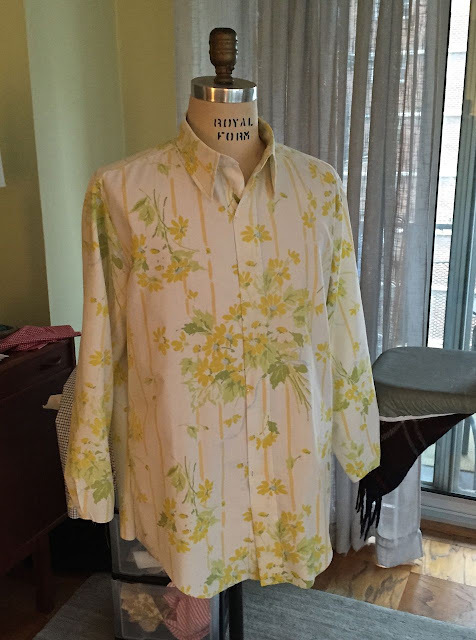 I just finished up Sewing Techniques I at FIT and used a very light cotton for the blouse portion. Was tricky especially on the bias covering of sleeve plackets - so lightweight! So, yes, cotton; but not too thin.